Posted July 10th, 2009 by Catherine Winters & filed under Blogosphere, Catherine, Cute, Events, Vancouver. Cupcakes may not be exactly as pictured. There. That’s sort of a title, right? 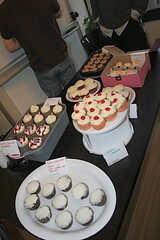 So yes, in just a few short hours, I will be attending CupCakeCampVancouver at Workspace in Gastown. While there, I will be eating cupcakes, looking at cupcakes, remembering cupcakes I’ve eaten in the past, and so on. I hadn’t originally been able to get a ticket, but managed to snag one this afternoon from a generous participant who wasn’t able to make it himself. (Thanks again, M!) I’m looking forward to it. CupcakeCamp Vancouver is an event built on the ‘barcamp’ model, where people come together to share and eat cupcakes, and participate in cupcake tasting competitions! You don’t need to bake any cupcakes to participate, but there will be prizes awarded to the winners in the big cupcake competitions! This event is not-for profit, and we will be donating all of the proceeds to the Downtown Eastside Women’s Centre, an organization that provides a safe, supportive space for women and children in Vancouver’s downtown east side. Please update with more cupcake pictures. Thank you.